The Story: "The Lost World: Tepuis"
Their first impression of the summit was one of inability mentally to grasp their surroundings. They appeared to have entered a strange country of nightmares, a wildly fantastic landscape. 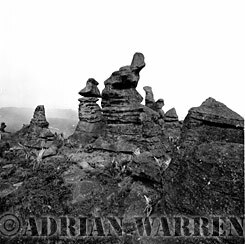 All around them were rocks and pinnacles that seemed to defy gravity and challenge imagination. 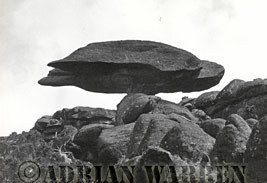 Rock shapes sculptured in the form "of caricatures of faces, of animals, of umbrellas, tortoises, churches, cannons, and of innumerable other most incongruous and unexpected objects". Between the rocks they noticed level spaces of pure yellow sand, with stream-lets and little waterfalls, and marshes with low, bristling vegetation. The first signs of animal life were large lizards that skittered from rock to rock, and the 'pipping' sounds of frogs. ten years later, in 1894, and was followed soon afterwards by a second expedition by the same two men. They reaped a wonderful harvest of curious and unique new plant and animal species, many of which were to bear the names of their discoverers. It took many years, however, to work through, and to catalogue, their collections. There were no dinosaurs, of course; neither were there any animals larger than a Coatimundi. 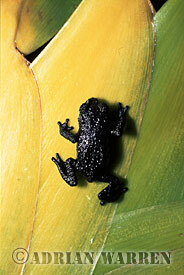 The animals that were found showed a high degree of melanism: black lizards, black frogs, black butterflies. Why black? Perhaps to aid in heat absorption on this chilly mountain top, and perhaps to provide camouflage on the weather beaten rock surfaces coated with blackish algae. The richness of the collections, however, were provided by the plants. Even IM Thurn, after only a few hours on the summit following his successful first ascent, wrote of the plants: "Probably no district of equally small size has yielded greater botanical results as has Roraima.... (it is) an oasis clothed with vegetation distinct from that of the country which immediately surrounds it." The summit of Mount Roraima turned out to be a harsh but beautiful world above the clouds. Im Thurn and Perkins had no sooner accomplished their historic first ascent of Roraima than a thick mist engulfed the summit, obscuring any view of more than fifty metres or so, and therefore limiting their exploration. After a very short time, the successful explorers began their descent, leaving it for future expeditions to carry out more detailed surveys of the mysterious plateau. Im Thurn's and Perkins' climb had opened the door to those who would reveal the true extent of Roraima's secrets; but it was another thirty years before aeroplanes revolutionised exploration. 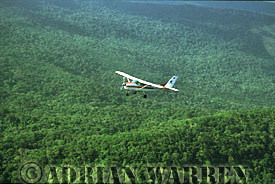 Suddenly, by air, stretches of forest that would have taken weeks to cut trails through could now be crossed in an hour. Places previously pronounced as inaccessible blanks on the map, and the impregnable summits of Tepuis, protected by the sheer rock walls that surround them, could now be reached and examined with ease and in comfort. It was daring but risky; pilots flew in their simple aircraft on haphazard routes through the mountains navigating with little more than a compass and a lot of guesswork. New worlds were discovered: mountains and rivers not previously known to exist. 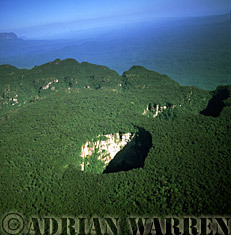 As recently as 1964, on a tepui called Sarisarinama, pilot Harry Gibson observed two spectacular sinkholes. As an expedition found in 1974, the sink holes are 1,000 feet deep and, in a sort of inverted "Lost World", harbour many unique species in strange, other worldly forest at their bases. One of the first pilot adventurers who ventured into this wild frontier terrain was an American called Jimmie Angel, who came looking for gold, but quite by accident, on 10th November 1933, stumbled upon the world's highest waterfall. He had been flying around the labyrinth of cliffs and canyons surrounding a huge plateau, to the west of Roraima, called Auyantepui, or "Devil Mountain". Through the mist he saw a column of water so high he turned to take another look. Jimmie Angel estimated the waterfall to be a mile high; it dwarfed his tiny plane. Jimmie had been trying to find a remote mountain top where, some years earlier, he claimed that, in the company of a gold prospector who knew that part of the country well, he had landed and they had filled sacks with gold nuggets. It was an attempt to find that mountain again that had led him on many flights, one of which was to take him into a dead end canyon in Devil Mountain where he saw the waterfall. Not many had believed his story of the gold, and not many believed his discovery of the mile high waterfall, until an expedition was sent by the National Geographic Society to measure it. 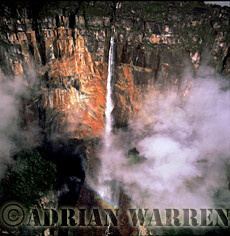 The official measurement fell short of a mile at 3,212 feet, but Angel Falls is the world's highest, and recognised as one of the world's great natural wonders. It is a peculiar irony, though, that a waterfall from Devil Mountain should come to bear the name of Angel. Jimmie Angel became famous for his discovery, although Venezuelans claim that they found the waterfall before him. This, however, did not bother Jimmie; he was involved in another project. He had become convinced that it was on the top of Devil Mountain that he, together with the prospector, had found the gold. He determined to find a place there to land his plane.